Transform your bedroom today with Cocoon by Sealy, giving you a new way to sleep comfortably. Cocoon by Sealy Chill is a soft premium memory foam mattress coupled with innovative cooling technology. This mattress is covered in a soft stretch-knit cover and infused with Phase Change Material, designed to absorb and dissipate heat for a refreshing, cool-to-the-touch surface. This perfect fit memory foam mattress gives you a higher quality and higher density foam that will cradle you while you sleep. 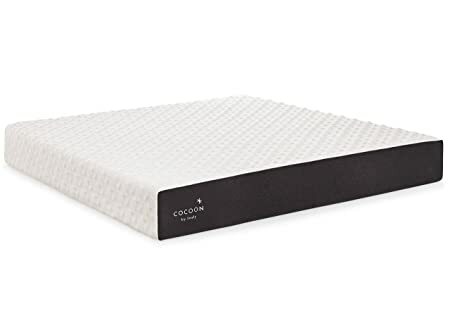 The Cocoon Chill mattress gives you essential support foam that your body needs to relax and is specially engineered to be durable and resilient. Delivered right to your door in an easily moveable box so you can maneuver your mattress into the perfect position. Made in the USA and backed by a 10-year warranty, Sealy is recognized as one of the industry’s top manufacturers of mattresses for 130 years. Cocoon by Sealy will transform the way you sleep. The California King mattress measures 83.5″ x 72″ x 10″. Transform your bedroom today with Cocoon by Sealy, giving you a new way to sleep comfortably. Cocoon by Sealy Chill is a soft premium memory foam mattress coupled with innovative cooling technology. This mattress is covered in a soft stretch-knit cover and infused with Phase Change Material, designed to absorb and dissipate heat for a refreshing, cool-to-the-touch surface. This perfect fit memory foam mattress gives you a higher quality and higher density foam that will cradle you while you sleep. The Cocoon Chill mattress gives you essential support foam that your body needs to relax and is specially engineered to be durable and resilient. Delivered right to your door in an easily moveable box so you can maneuver your mattress into the perfect position. Made in the USA and backed by a 10-year warranty, Sealy is recognized as one of the industry’s top manufacturers of mattresses for 130 years. Cocoon by Sealy will transform the way you sleep. The Twin mattress measures 74.5″ x 38″ x 10″. Transform your bedroom today with Cocoon by Sealy, a Soft premium memory foam mattress with comfortable, innovative layers that will enhance the way you rest. A soft stretch-knit cover with spun poly fibers is designed to be breathable to help keep you cool and durable to protect your mattress. The Perfect Fit Memory Foam layer gives you a higher quality and higher density foam that will cradle you as you sleep while the strong, resilient Comfort layer and Support layer provide the essential, supportive base that your body needs to relax. The Cocoon by Sealy is delivered right to your door in an easily moveable box so you can maneuver your mattress into the perfect position. Made in the USA and backed by a 10-year warranty, Sealy is recognized as one of the industry’s top manufacturers of mattresses for 130 years. Cocoon by Sealy will transform the way you sleep. Transform your bedroom today with Cocoon by Sealy, a Firm premium memory foam mattress with comfortable, innovative layers that will enhance the way you rest. A soft stretch-knit cover with spun poly fibers is designed to be breathable to help keep you cool and durable to protect your mattress. The Perfect Fit Memory Foam layer gives you a higher quality and higher density foam that will cradle you as you sleep while the strong, resilient Comfort layer and Support layer provide the essential, supportive base that your body needs to relax. The Cocoon by Sealy is delivered right to your door in an easily moveable box so you can maneuver your mattress into the perfect position. Made in the USA and backed by a 10-year warranty, Sealy is recognized as one of the industry’s top manufacturers of mattresses for 130 years. Cocoon by Sealy will transform the way you sleep. Transform your bedroom today with Cocoon by Sealy, giving you a new way to sleep comfortably. Cocoon by Sealy Chill is a firm premium memory foam mattress coupled with innovative cooling technology. This mattress is covered in a soft stretch-knit cover and infused with Phase Change Material, designed to absorb and dissipate heat for a refreshing, cool-to-the-touch surface. This perfect fit memory foam mattress gives you a higher quality and higher density foam that will cradle you while you sleep. The Cocoon Chill mattress gives you essential support foam that your body needs to relax and is specially engineered to be durable and resilient. Delivered right to your door in an easily moveable box so you can maneuver your mattress into the perfect position. Made in the USA and backed by a 10-year warranty, Sealy is recognized as one of the industry’s top manufacturers of mattresses for 130 years. Cocoon by Sealy will transform the way you sleep. The Full mattress measures 74.5″ x 53″ x 10″. Transform your bedroom today with Cocoon by Sealy, giving you a new way to sleep comfortably. Cocoon by Sealy Chill is a firm premium memory foam mattress coupled with innovative cooling technology. This mattress is covered in a soft stretch-knit cover and infused with Phase Change Material, designed to absorb and dissipate heat for a refreshing, cool-to-the-touch surface. This perfect fit memory foam mattress gives you a higher quality and higher density foam that will cradle you while you sleep. The Cocoon Chill mattress gives you essential support foam that your body needs to relax and is specially engineered to be durable and resilient. Delivered right to your door in an easily moveable box so you can maneuver your mattress into the perfect position. Made in the USA and backed by a 10-year warranty, Sealy is recognized as one of the industry’s top manufacturers of mattresses for 130 years. Cocoon by Sealy will transform the way you sleep. The Queen mattress measures 79.5″ x 60″ x 10″. Transform your bedroom today with Cocoon by Sealy, giving you a new way to sleep comfortably. Cocoon by Sealy Chill is a firm premium memory foam mattress coupled with innovative cooling technology. This mattress is covered in a soft stretch-knit cover and infused with Phase Change Material, designed to absorb and dissipate heat for a refreshing, cool-to-the-touch surface. This perfect fit memory foam mattress gives you a higher quality and higher density foam that will cradle you while you sleep. The Cocoon Chill mattress gives you essential support foam that your body needs to relax and is specially engineered to be durable and resilient. Delivered right to your door in an easily moveable box so you can maneuver your mattress into the perfect position. Made in the USA and backed by a 10-year warranty, Sealy is recognized as one of the industry’s top manufacturers of mattresses for 130 years. Cocoon by Sealy will transform the way you sleep.The Twin mattress measures 74.5″ x 38″ x 10″. Transform your bedroom today with Cocoon by Sealy, a Soft premium memory foam mattress with comfortable, innovative layers that will enhance the way you rest. A soft stretch-knit cover with spun poly fibers is designed to be breathable to help keep you cool and durable to protect your mattress. The Perfect Fit Memory Foam layer gives you a higher quality and higher density foam that will cradle you as you sleep while the strong, resilient Comfort layer and Support layer provide the essential, supportive base that your body needs to relax. The Cocoon by Sealy is delivered right to your door in an easily moveable box so you can maneuver your mattress into the perfect position. Made in the USA and backed by a 10-year warranty, Sealy is recognized as one of the industry’s top manufacturers of mattresses for 130 years. Cocoon by Sealy will transform the way you sleep. The Twin mattress measures 74.5″ x 38″ x 10″. Transform your bedroom today with Cocoon by Sealy, a Firm premium memory foam mattress with comfortable, innovative layers that will enhance the way you rest. A soft stretch-knit cover with spun poly fibers is designed to be breathable to help keep you cool and durable to protect your mattress. The Perfect Fit Memory Foam layer gives you a higher quality and higher density foam that will cradle you as you sleep while the strong, resilient Comfort layer and Support layer provide the essential, supportive base that your body needs to relax. The Cocoon by Sealy is delivered right to your door in an easily moveable box so you can maneuver your mattress into the perfect position. Made in the USA and backed by a 10-year warranty, Sealy is recognized as one of the industry’s top manufacturers of mattresses for 130 years. Cocoon by Sealy will transform the way you sleep. The King mattress measures 79.5″ x 76″ x 10″. Transform your bedroom today with Cocoon by Sealy, giving you a new way to sleep comfortably. Cocoon by Sealy Chill is a soft premium memory foam mattress coupled with innovative cooling technology. This mattress is covered in a soft stretch-knit cover and infused with Phase Change Material, designed to absorb and dissipate heat for a refreshing, cool-to-the-touch surface. This perfect fit memory foam mattress gives you a higher quality and higher density foam that will cradle you while you sleep. 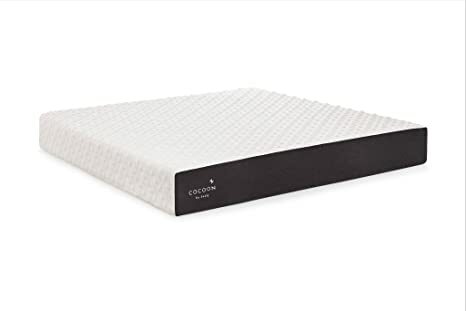 The Cocoon Chill mattress gives you essential support foam that your body needs to relax and is specially engineered to be durable and resilient. Delivered right to your door in an easily moveable box so you can maneuver your mattress into the perfect position. Made in the USA and backed by a 10-year warranty, Sealy is recognized as one of the industry’s top manufacturers of mattresses for 130 years. Cocoon by Sealy will transform the way you sleep. The Full mattress measures 74.5″ x 53″ x 10″. Transform your bedroom today with Cocoon by Sealy, a Firm premium memory foam mattress with comfortable, innovative layers that will enhance the way you rest. A soft stretch-knit cover with spun poly fibers is designed to be breathable to help keep you cool and durable to protect your mattress. The Perfect Fit Memory Foam layer gives you a higher quality and higher density foam that will cradle you as you sleep while the strong, resilient Comfort layer and Support layer provide the essential, supportive base that your body needs to relax. The Cocoon by Sealy is delivered right to your door in an easily moveable box so you can maneuver your mattress into the perfect position. Made in the USA and backed by a 10-year warranty, Sealy is recognized as one of the industry’s top manufacturers of mattresses for 130 years. Cocoon by Sealy will transform the way you sleep. The Twin XL mattress measures 79.5″ x 38″ x 10″. Transform your bedroom today with Cocoon by Sealy, giving you a new way to sleep comfortably. Cocoon by Sealy Chill is a soft premium memory foam mattress coupled with innovative cooling technology. This mattress is covered in a soft stretch-knit cover and infused with Phase Change Material, designed to absorb and dissipate heat for a refreshing, cool-to-the-touch surface. This perfect fit memory foam mattress gives you a higher quality and higher density foam that will cradle you while you sleep. The Cocoon Chill mattress gives you essential support foam that your body needs to relax and is specially engineered to be durable and resilient. Delivered right to your door in an easily moveable box so you can maneuver your mattress into the perfect position. Made in the USA and backed by a 10-year warranty, Sealy is recognized as one of the industry’s top manufacturers of mattresses for 130 years. Cocoon by Sealy will transform the way you sleep. The Queen mattress measures 79.5″ x 60″ x 10″. Transform your bedroom today with Cocoon by Sealy, a Soft premium memory foam mattress with comfortable, innovative layers that will enhance the way you rest. A soft stretch-knit cover with spun poly fibers is designed to be breathable to help keep you cool and durable to protect your mattress. The Perfect Fit Memory Foam layer gives you a higher quality and higher density foam that will cradle you as you sleep while the strong, resilient Comfort layer and Support layer provide the essential, supportive base that your body needs to relax. The Cocoon by Sealy is delivered right to your door in an easily moveable box so you can maneuver your mattress into the perfect position. Made in the USA and backed by a 10-year warranty, Sealy is recognized as one of the industry’s top manufacturers of mattresses for 130 years. Cocoon by Sealy will transform the way you sleep. The Queen mattress measures 79.5″ x 60″ x 10″.